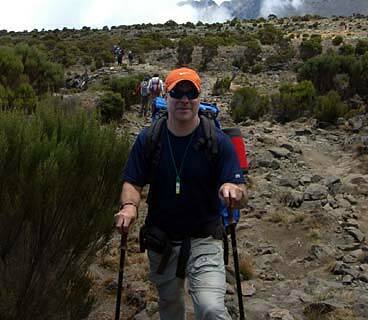 Climbing Kilimanjaro has always been on my list of things to do in my lifetime. But it always seemed to be out there in front of me. I finally got myself motivated to take action after taking a climbing class a couple of years ago and accomplishing one of my other goals this past year: climbing Rainier. 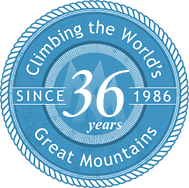 I also reasoned that since I had a several weeks of extra vacation, and my husband didn't really like the high altitude climbing nor did he have lots of vacation, I probably should take the leap and find a good company that did the trip. Being a good Sagittarian, I have always been pretty adventurous, so it wasn't much of a stretch. I was a bit worried about the "guided tour" part of this trip. I've always stayed away from trips that have a set itinerary and a guide. 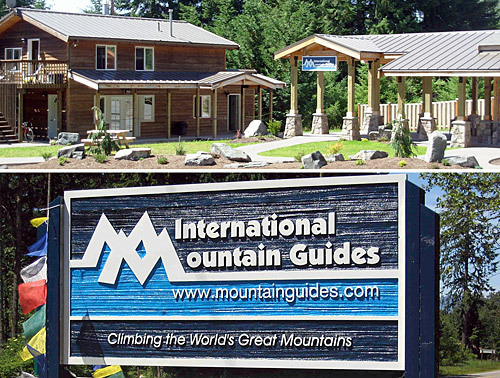 But I knew that I would need a guide to climb the mountain and figured it would be best to find a US based company as opposed to showing up in Moshi and hiring someone there like my son and his friends kept suggesting. My first step in selecting a company was to decide which route I wanted to take. That was easy. 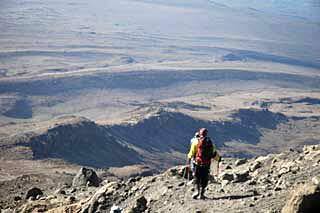 As soon as I read the description of the Machame route, I knew that I wanted the added challenge and variation that route provided. Then I just needed to find a company that guided that route. 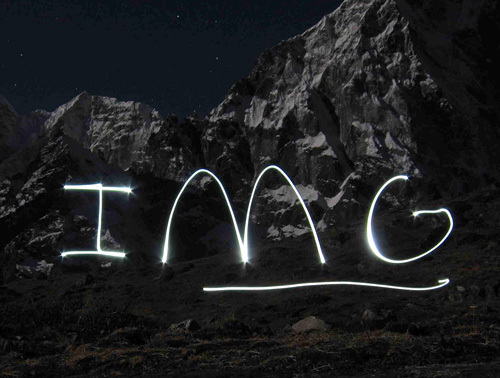 I'm really not sure how I settled on International Mountain Guides, but am glad that I did. Of course, we all fear the unknown a bit and I was somewhat concerned about the dynamics of a bunch of people that I didn't know. Would it be two of the greatest weeks of my life, or would the group dynamics be such that by the end of the trip I just wanted to get away from them. As it turned out, no worries! The trip was, in fact, the trip of a lifetime, and hopefully the first of several to come. Not one of my worries materialized. 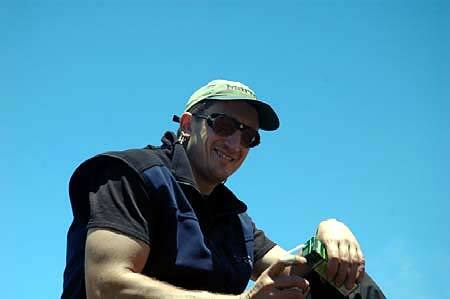 IMG, more specifically, Phil Ershler, our guide was instrumental in making this the best experience I ever had. But beyond that, it was such a great group of people. We seemed to develop a bond extremely quickly. Considering we spent a great deal of time with each other, everyone got along really well. There was a great deal of joking around and some pretty interesting conversations on the trail and in the mess tent. Everyone really took care of each other as well. I think that was probably one of the things that pulled us all together. It may have been luck that brought us all together, and the next trip may not be the same, but this was truly an incredible group of people. Phil Ershler - can't say enough about Phil. We were fortunate to have him as our guide. 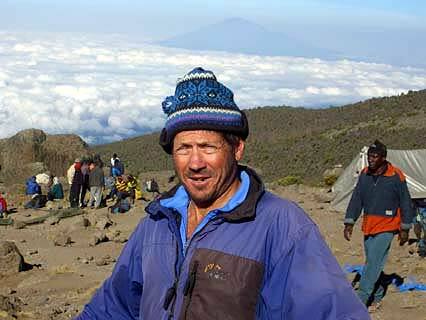 I learned a lot from him over the course of the two weeks about high altitude climbing. I hope to climb with Phil again sometime. Tammy Gorman - the Office Manager for IMG and lives in Ashford, WA. John and Kim Kirchner - Owners of Crystal Mountain and other ski resorts. Kim also works in ski patrol at Crystal. They live in Bellevue, WA. Rob and Kerri Perissi - Live in NY on Long Island. Rob is an IT manager and Kerri works from home. Bavesh and Alpie Patel - live in Washington DC. Newlyweds on their honeymoon. 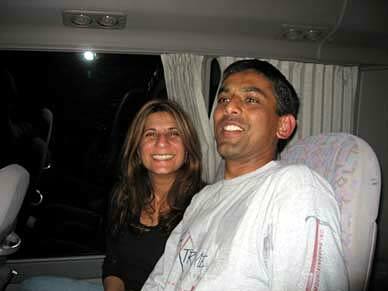 Bavesh is an aerospace engineer in rocket technology and if I remember correctly, Alpie works in marketing. Most of us met at the KLM departure gate on Monday Sept 18th. I was watching all the people starting to show up and trying to figure out who might be with our group. Paul spotted me first from my CTT luggage tag. It wasn't long that Phil, Tammy and several others showed up and we made introductions. Once we arrived in Arusha, it took a little while to get through immigration and then loaded onto a bus to the Keys Hotel. 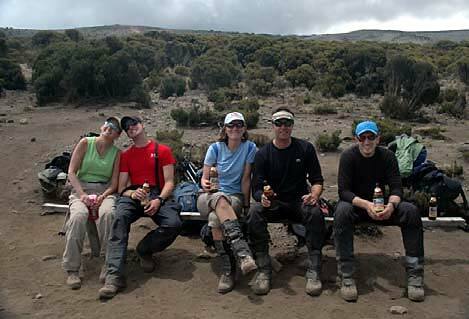 We started our trip with the first round of Kilimanjaro Beer that evening before heading off to bed. The next morning we met with the folks from Porter Assistance and learned a bit about the working conditions of the porters and what we can do to help. 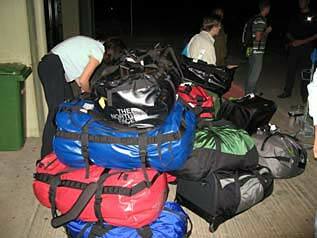 Then went thru the logistics for the upcoming climb, what to pack, what to expect, that sort of thing. It was a very laid back day. We also had some time to visit a Moshi market. We left for the climb on Wed. Sept 20th. 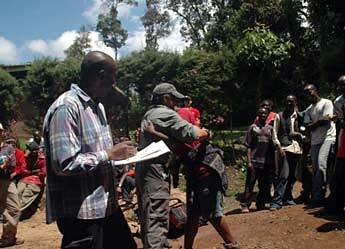 We arrived at Machame Gate close to noon to start walking. The first day was about a 6 mile walk with a 4000 ft elevation gain. A good warm-up for later in the week. 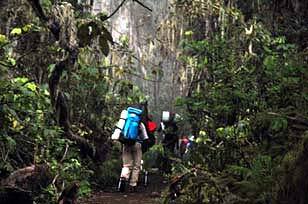 We started out in the rain, but it quickly stopped and we walked up thru the rain forest to our first camp. Phil started us at a nice leisurely pace so that we wouldn't burn out and we had rest stops about every hour. 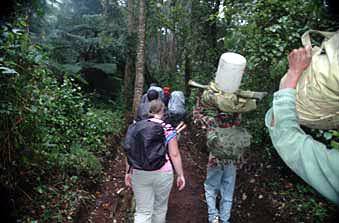 We also quickly learned to get out of the way of our porters as they carried their loads. They would always leave after us each morning but arrive at camp long before us and have everything set up and ready. They were truly amazing!! We even had one woman porter on our team. 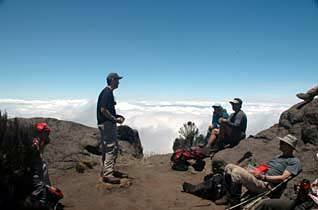 We arrived at Machame Hut (around 10000 Ft) mid afternoon. 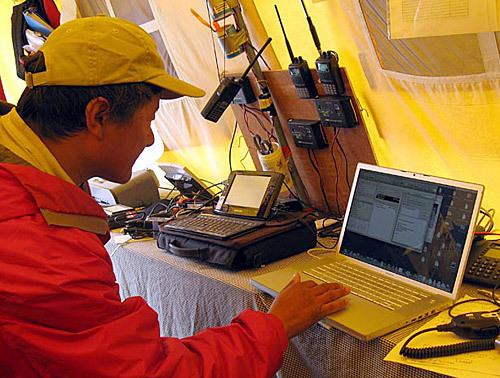 We were barely into camp when Phil was calling us into the mess tent for our daily afternoon snack. Popcorn, nuts, biscuits or some other snack was always there for us. Plus thermoses of hot water for tea, hot chocolate or whatever else we wanted to drink. It was the afternoon ritual to snack and drink as much as we could. Hydration was a priority. Our cooks had dinner ready for us around five every night, close to dusk. I, for one, did not expect to have such good food on the mountain. We always started with a cream based soup, then some kind of filling main course such as spaghetti or stew with rice, chicken dishes etc. They always had a pot of vegetarian food as well since we had several members of our group who were vegetarian. Then we ended with a fruit or something for dessert. And, of course, lots of hot water for tea or hot chocolate. The camps were pretty interesting. Between all the climbing parties and their porters there were well over 100 people in the camps each night. There were outhouses scattered around and we generally had the selection of a couple of different ones fairly close by. The outhouses were something to behold. Some had doors while others just had a walled off section. They were basically a hole in the floor that you had to squat over and aim well. The higher up we got, the worse the bathroom conditions. The holes got smaller and the aim got worse. We went through a lot of Purrell! After the first night, it was a contest to see how long we could stay up. 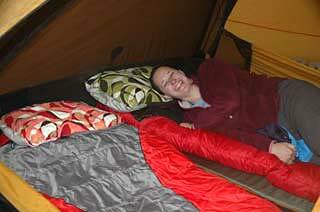 Most nights we really pushed to get to 8pm, but generally it was closer to 7 when we started heading to the tents. But then we all had the ritual 2-3 times a night bathroom runs due to all the fluids we were drinking. The second morning of the climb started about 6:30AM when most of us woke up and started getting organized for the day. Of course our cooks had hot water for coffee or tea ready for us around 6:30 or 7 followed by breakfast. There was definitely no shortage of food on this trip  made more amazing since our porters carried it the whole way. We would see crates of eggs and bags of potatoes strapped onto the loads that were being carried. Breakfast typically included great porridge and toast. The margarine was pretty useless after the first day due to the cold temps at night - but we made due with peanut butter and jam. They also served some kind of egg dish  omelet, scrambled, fried and bacon or sausage and fruit  more than enough to get us to lunch.
. We got to our next camp at Shira Hut by mid-afternoon after a long day walking. Shira Hut sits on a large plateau at about 12,500 ft at the point where we would start traversing the mountain. The vegetation seemed somewhat similar to what you find near the old volcanic areas of eastern Idaho  lots of scrub bushes, some wild flowers and small senecio trees. 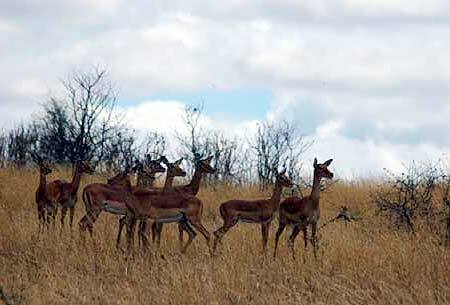 The camp was settled on a fairly large plateau with several different groups spread out across the area. As we were getting ready for dinner, the sun started setting. 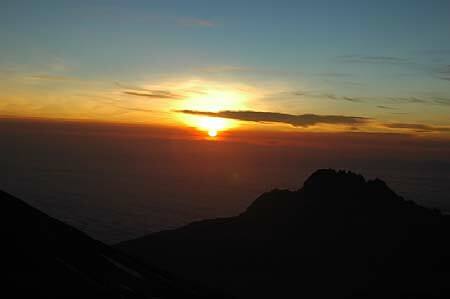 This would be the first real sunset we would see on Kili. 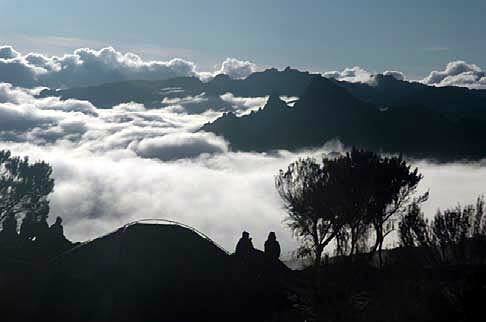 Looking out over the valley, the clouds were settled beneath us with lower peaks poking up through the clouds. As the sun started to set, we watch the mountain turn to the golden color of alpenglow  it was an incredible sight. We had dinner and struggled to stay awake until 8pm. 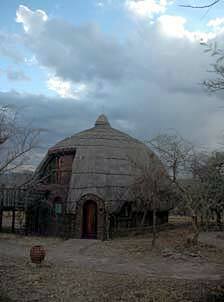 We drifted off to sleep listening to the chatter of Swahili as the porters talked into the evening. 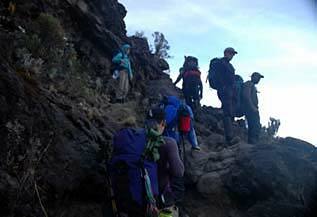 The next morning we were to head to Barranco Camp at the base of Barranco Wall. This was not to be too long of a hike, but we had a lot of up and down to do. 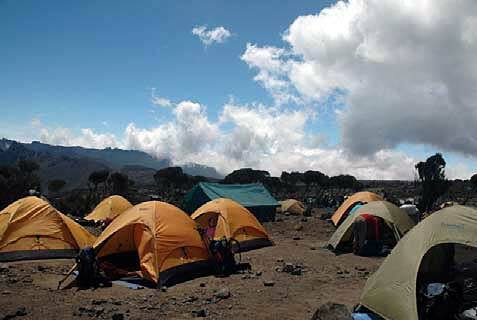 We would leave leave Shira Camp and begin a climb up a couple of thousand feet to around 14,500 ft and then head back down to around 13,000 ft. There were actually a couple of ups and downs along the way. The terrain was much more barren as we got higher on the mountain  more volcanic geological formation and interesting looking caves in the cliffs. The plant life was minimal up there. 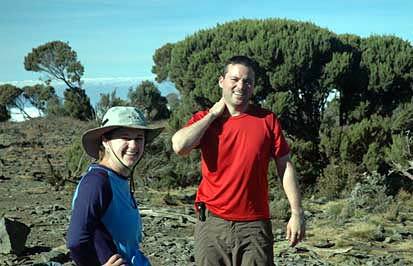 When we got to the high point, we spent some time taking photos and getting ready for a steep hike down into a valley. Walking poles were used by all to help with stability and avoid slipping and falling. We lost a great deal of our elevation, only to have to re-gain it on the other side of the valley. 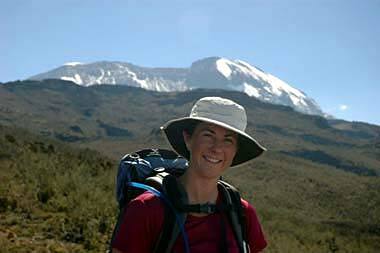 As we continued our traverse around Kilimanjaro, one of the things that struck me was how the look of the mountain continued to change. We continued to see different rock and glacier formations and the profile continued to evolve into the one that I've seen in pictures. I think that it was during this day that John and Walt started to hatch their plan of skiing and paragliding off of one of the glaciers. 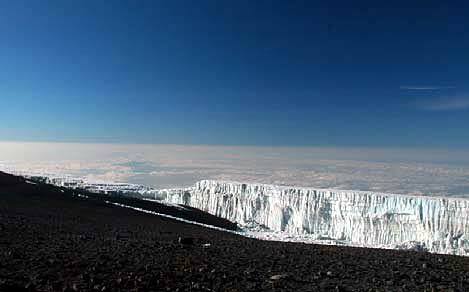 Their biggest challenge would have been how to get past that last outcrop of rock where the glacier ended. Our final descent took us down into the valley where Barranco Hut was located. Before we started down, we could clearly see what we would face tomorrow. 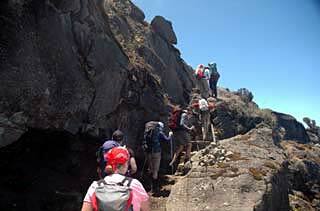 The trail up the Barranco wall looked like a snake going straight up the rock cliff. 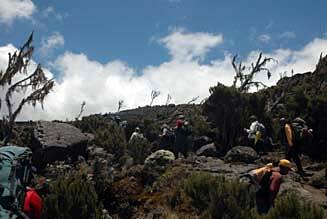 The camp at Barranco Hut is situated next to a creek and as we got closer to camp, the vegetation changed yet again. The senecio trees were abundant in this valley as were the smaller lobelia plants. The senecio's looks like somewhat deformed palm trees, but with wider trunks and shorter branches. We got into camp a little after noon and of course the porters had long since passed us up since we were going at a "poli - poli" pace. Our camp was set up and lunch was ready and waiting for us. Since we were there so early, we had quite a bit of time to relax in the afternoon. I think that this was the first of the Hearts matches. Of course I think that Phil won most of the time  probably has something to do with lots of time sitting in tents waiting for weather to clear. Lots of Practice!!! We had some great times in the mess tent in between and during meals. We discussed everything from current affairs, to climbing trips, to our work life and family. While the discussion turned raunchy at times, it was all in good fun and we continued to bond as a group. Our trail discussions were great as well. Eric set such a great pace that we were able to carry on conversations even when we were hauling ourselves up the steep parts. It was such a difference than some of my climbs in the Cascades with the 20-somethings from BOEALPS who seem to like to run up the mountains. I'm always playing catch-up with them. 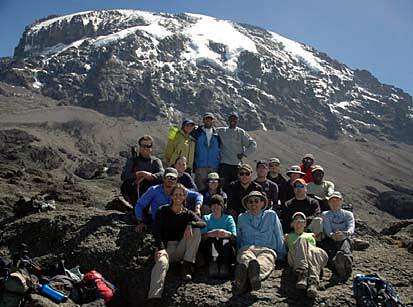 By this time in the climb a few of us were also dealing with some health issues. I had a nasal allergy that seemed to turn into a sinus infection (antibiotics work miracles). Tammy was struggling with an intestinal bug and finally resorted to Cipro. Laura had an ear infection that Paul was able to provide another antibiotic for and Terry was struggling with getting oxygen into his blood which turned out to be some kind of a lung infection. (we were keeping tabs on our oxygen level with Phil's Pulse/Ox meter). I was so impressed with Tammy and Laura's perseverance and positive attitude even though they felt terrible. And they kept pushing themselves to keep going forward. We had another nice sunset and beautiful alpenglow on the mountain just before dinner. We ate well and went to sleep to the sound of Swahili. For me, sleep was never very sound Between needing to get up and go to the bathroom or blow my nose, I was awake quite a bit, and always fully awake around 4 or 5am. The next morning was Saturday although I don't think that most of us really knew what day it was. This was the section of the trail that I had been looking forward to. 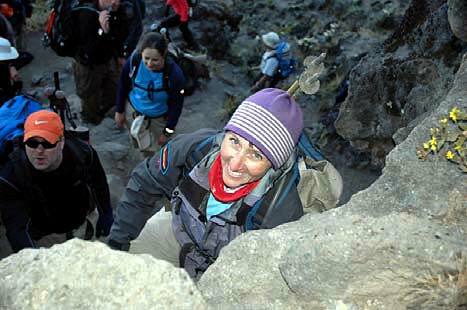 It involved the steep climb up Barranco wall. It was a great scramble up. Not too difficult compared with others I've done in the Cascades, but the rock was great. Wished I had a rope and harness to do some rock climbing in some of the sections we went by. 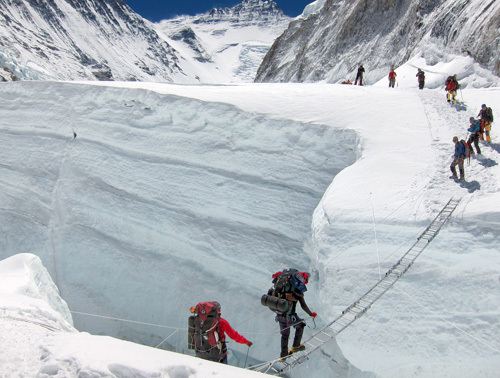 What was really incredible was that as our group was making its way up the wall, the porters were passing us up with their heavy loads balanced on their heads. I didn't see any of them mis-step and they certainly didn't use their hands as much as we did. 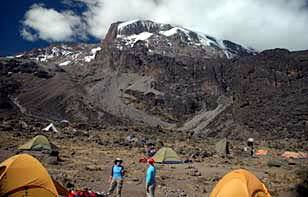 By the time we got to the top, most of the porters had passed us up and they left camp well after we did. 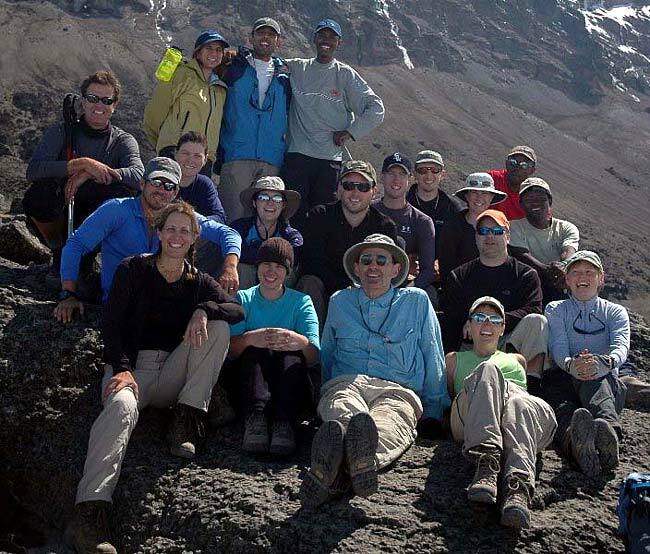 At the top of the wall, we took time for a group photo with Kili in the background and continued on our way into Karanga Valley. This was a relatively short hike  dropping us down into a valley and then up another ridgeline before dropping us down into Karanga Valley. 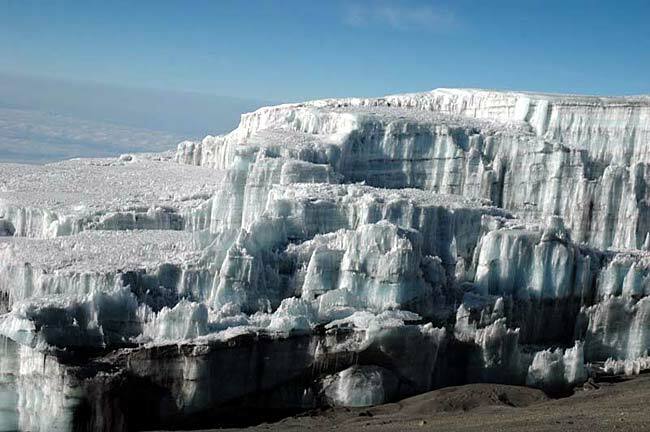 This would be the last water source until we got back down the Mweka Camp after summiting. As a result, the porters would make several trips down into the valley to fill up the gerry cans with enough water to get us through the next two days. 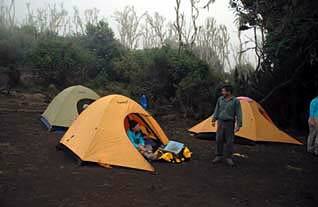 Camp is actually at the top of a plateau above the valley in an effort to protect the vegetation around the creek. We all filled up all our water bottles before going up the last ridge to camp. 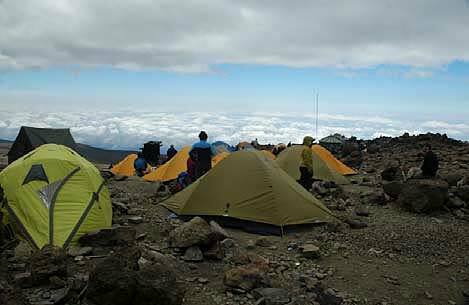 We got to the camp at around 13000 feet by early afternoon and had lunch and another relaxing afternoon. There were more rounds of Hearts and some other card game that I don't even remember now. Of course lots of hot drinks and snacks and then dinner. I think that we managed to stay awake a bit later this night, but not by much. We all pretty much crash around 8PM. The next morning, Terry was the last one to get up and it was obvious that he wasn't well. He was dizzy and pulse/ox reading was low. 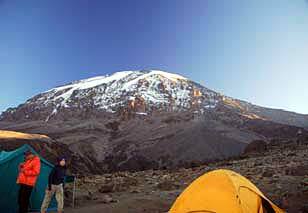 Thinking that it was the altitude that was affecting him, Phil made the decision to send him down to wait for us at Mweka Camp. Since it turned out he had a lung infection which prevented him from getting enough oxygen into his system, it was good that he went down. 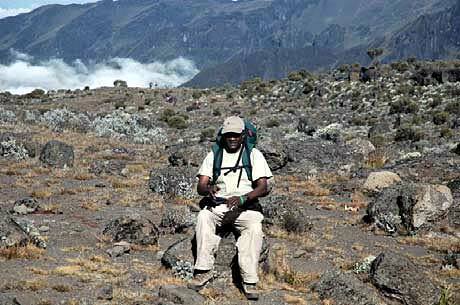 Even at the 10,000 foot elevation of Mweka Camp, he was still struggling. This was a reminder that the most important thing is getting off the mountain alive and any one of us could have suffered from an illness that required our descent. 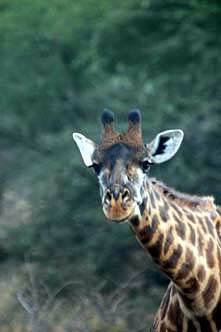 But we would miss one of our teammates during the last part of the climb. 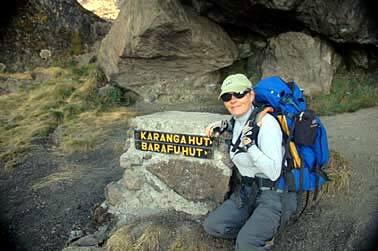 We were now ready to head up to high camp at Barafu Hut. 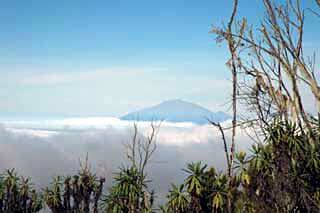 We were done with the traversing around the mountain and the ups and downs of the valleys and ridges as we went. 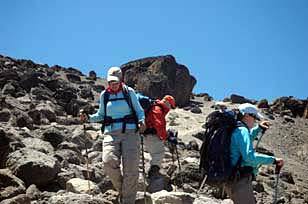 We would now head directly up a ridge for about 2000 ft to Barafu. 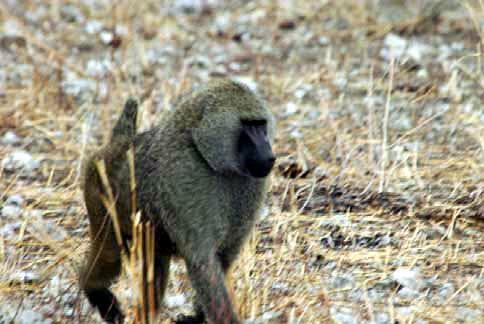 It wasn't a long hike in miles, but with the higher altitude, Eric was setting a much slower pace. We all concentrated on pressure breathing to make sure we were getting enough oxygen and the going was slow. 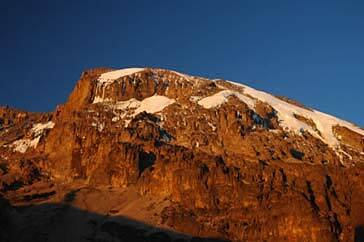 Barafu Hut is at around 15,000  higher than most of us had ever been before. We had lunch, lots of hot drinks and then an early dinner and more hot drinks  our goal was to get to bed by around 5 so we could get up by 11pm. We got our summit packs ready, making sure we had a plan to easily get at our warm jackets, water and food when we had a rest stop. 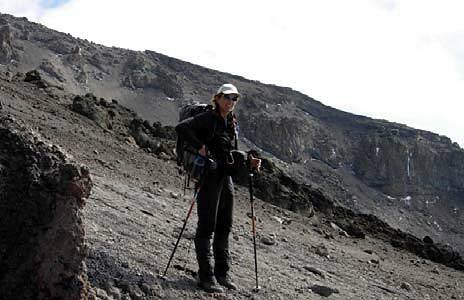 Tammy and Alpie struggled more as we got to this altitude and both decided that they would stay at Barafu the next morning instead of trying to summit. 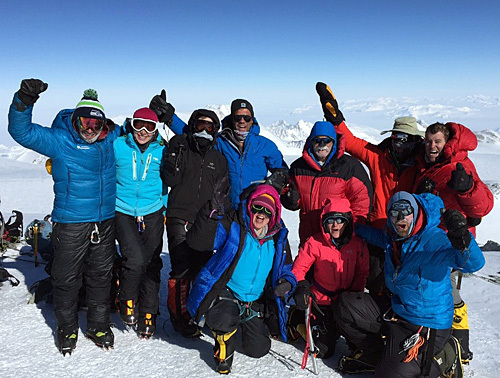 Even though they couldn't summit, this was a big accomplishment for each of them. 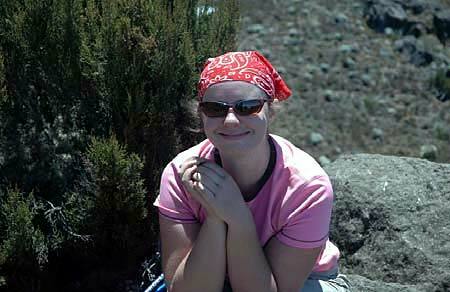 Tammy had been so ill early in the climb, and this was the farthest and highest she's ever been. Alpie had not had a lot of prior hiking experience on steep terrain which probably took its toll on her as we encountered some of the tough spots. I'm not sure how many of us got any sleep at all. I was able to doze a bit between my bathroom runs. I'm not sure if it was Phil or Eric that came around at 11PM to wake us up, but we all got up pretty quickly, got ourselves together, met in the mess tent for some tea and biscuits and were on our way by midnight. The summit climb started out relatively warm, but that was a teaser. With each rest stop, it got progressively colder until the sun came up. Of course, many of us were plagued with a nagging headache and some of us with an upset stomach the higher we got. 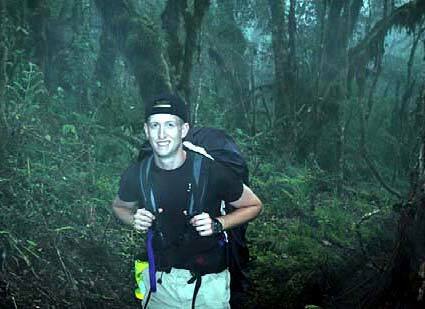 At some point, not sure exactly where, Paul got too ill to continue and one of the porters that started up with us took him back down. He had not been feeling well during the night. As for myself, I started getting a headache after about the first hour and an upset stomach after about 3 hours. The last couple of hours before sunrise were the worst, between the cold and the altitude affects. I really appreciated both Phil and Bob keeping me focused on one rest step after the other and breathing until first, I threw up my last snack of goo and then finally made it to the top. 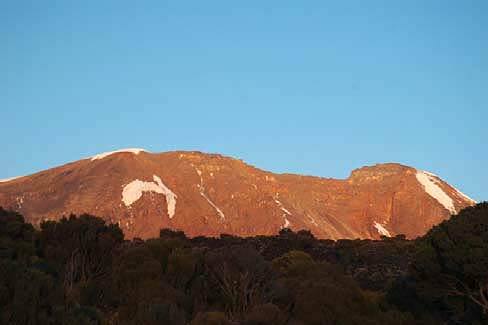 Then amazingly, as soon as I reached the rest of the group at the crater rim just as the sun was coming up, I quickly put it all out of my mind and just soaked up the joy of being there. 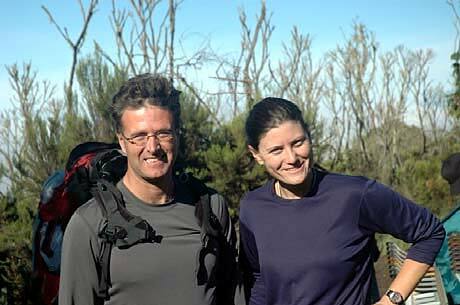 We got to the crater rim at 6AM  pretty good time. 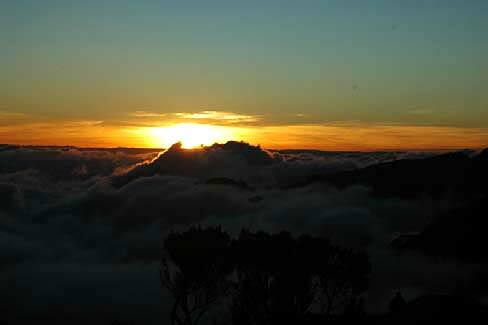 It was probably one of the most amazing feelings of my life to be standing there looking out over Africa with the sun rising. At that moment, I really wished my husband could have been there to share it with me. 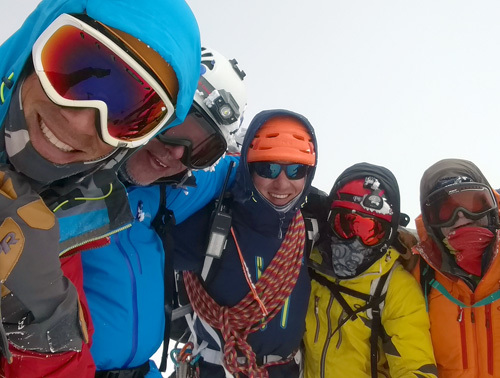 We all took a moment to congratulate each other and get a drink, but then it was on to the summit. The path to the summit seemed to go on forever  a pretty long 45 minutes of walking. 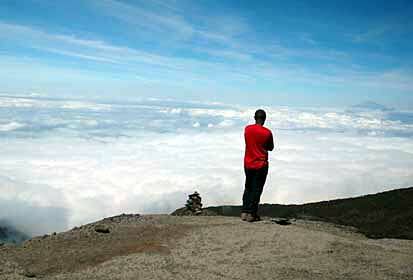 I have to admit that as I approached the summit, I had tears in my eyes  it was a pretty emotional experience for me. 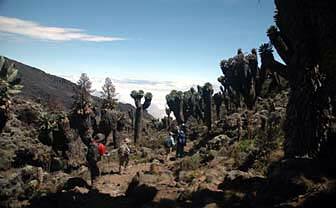 The summit was pretty crowded with people, since we were now joined with the climbers from the Marango route. 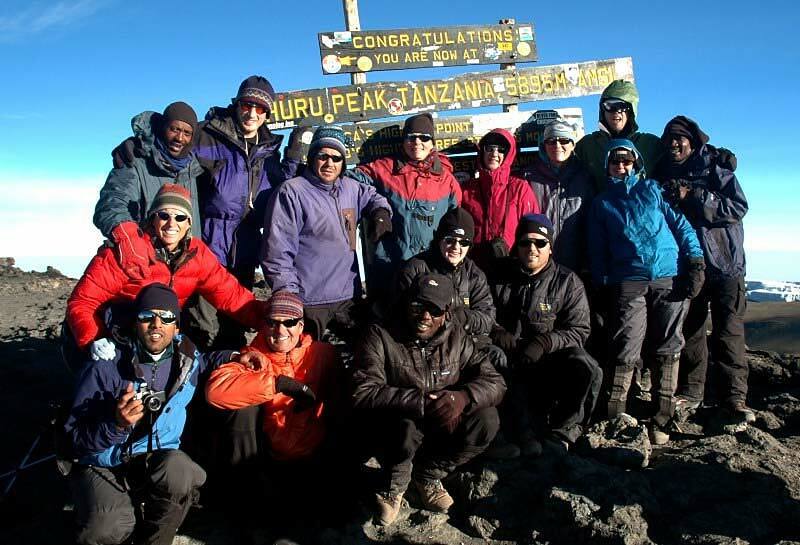 We all took some time to enjoy the views of the ice cliffs and the terrain at the top of Africa and then jostled our way around everyone to get the summit photos. 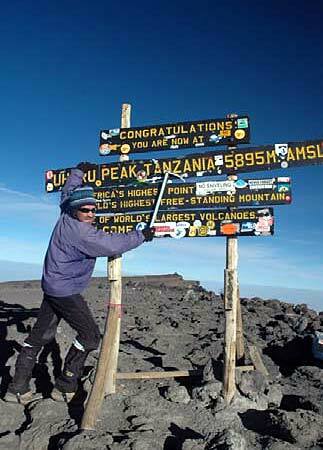 I got the shots of Phil with his demo ice axe, like he really needed one on the summit of Kili. I was surprised that there was absolutely no snow at the summit  I guess I had imagined more snow at the top. We probably spent about a half hour on the summit and then we were all ready to head down. We collected our packs and started back down by a slightly different route than we went up. We did a lot of sliding down the scree that was covering the trail, but our descent was really pretty quick. We were back down in camp by 11:00. But of course, our day wasn't over yet. We changed into cooler clothing, cleaned up and got everything packed and ready to go while our cooks fixed us some lunch. 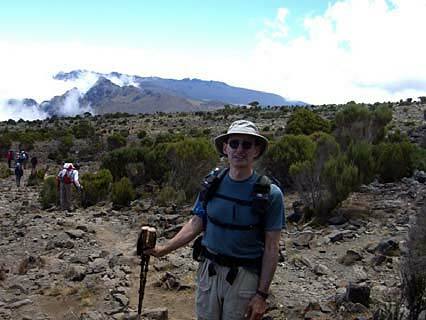 We were back on the trail down to Mweka camp before 1. We still had a long downhill hike to do. 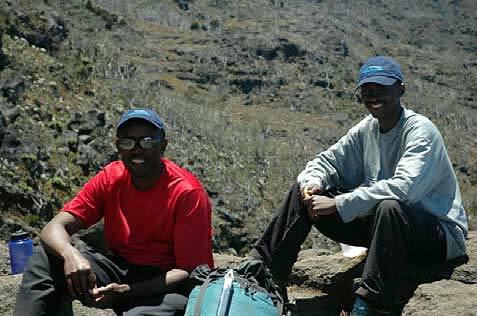 We had already come down 4000 ft to Barafu and still needed to descend another 5000 ft to Mweka. Tough day on the feet and knees!!! 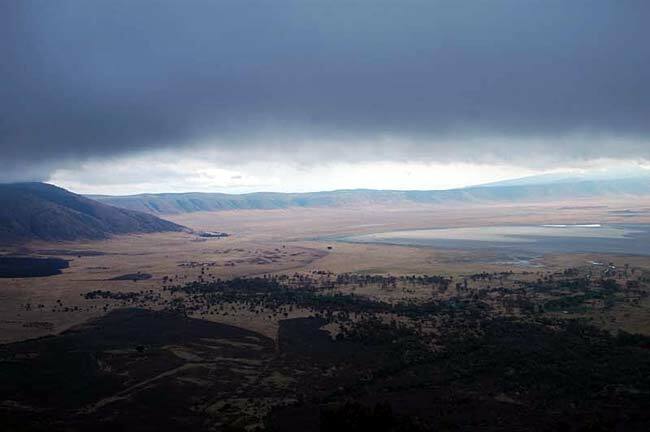 Since the trek down was by a different route than the one we came up, we quickly started passing thru the different climate zones  from the high desert all the way down to the start of the rain forest. I was with a small group that left camp first that included Bob, Walter, John, Kim and Tammy. Thomas was our designated "chauffeur" for this section and we did some stop and go as Walter was getting lessons in Swahili as we went down. It was pretty entertaining. We were a bit ahead of the rest of the group when we got to High Camp after about 2500 ft of the descent so we stopped to wait for everyone to re-group. High Camp has a supply of Coke and Kilimanjaro Beer. 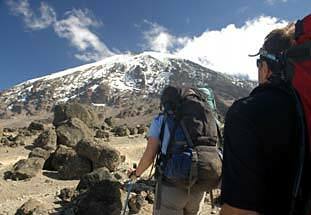 We decided that a Kili Beer would be great to quench our thirst  probably not the wisest choice, since a good beer at 12,500 ft can really give you a kick, but no worries, we all made it down with only a couple of stumbles on my part which kept Bob entertained! 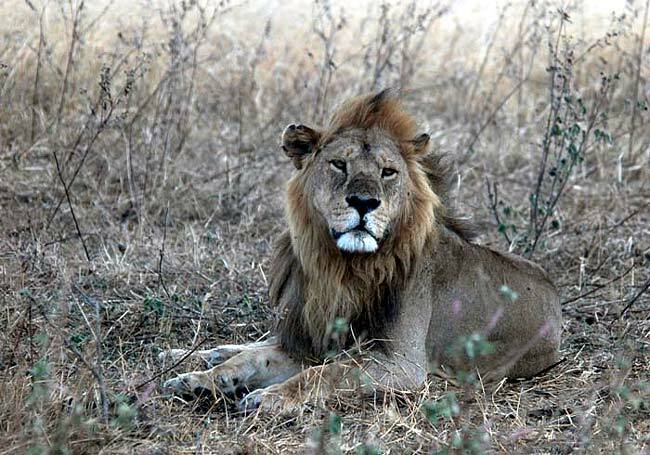 Terry was waiting for us in Mweka camp and unfortunately still having trouble breathing. Between Lynda, Lynette and Paul, they determined that he likely had some sort of lung infection and came up with some medication to try to help him until he could get home to his doctor. This was to be our last night on the mountain so we celebrated with dinner and there was a challenge for another hearts match, but it didn't take too long for everyone to decide that we were just too tired to stay awake any longer. We barely made it to 8PM before we crashed. The next morning was a beautiful day, so our hike out was going to be nice. 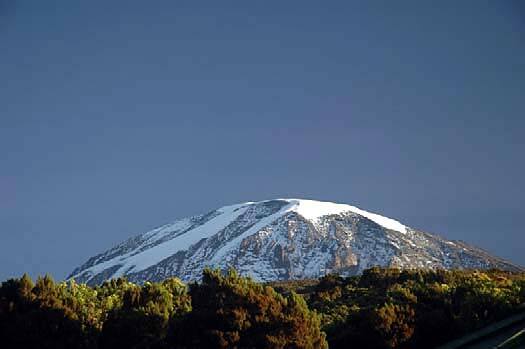 We also discovered that it had snowed on the mountain sometime during the late afternoon or evening and there was fresh snow visible, it was a beautiful sight. We started the day with our usual breakfast of porridge, toast, eggs and bacon, packed up and started our walk out. We still had about 5000 feet of elevation to descend in about six miles. So it was a bit of a hike. The trail was steep in a lot of sections, but it had recently been re-worked and was in excellent shape. Overall it was a pretty easy hike out. 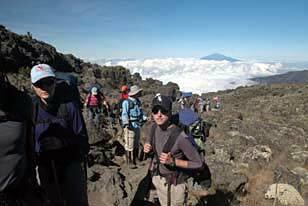 During this section, we really had to be careful when we heard the porters coming. They were ready to get off the mountain and back home and most would be running down the trail with their loads. If you weren't careful, they would run you over. We kept thinking we might see something in the trees, like a monkey or two, and eagle-eye Bob spotted a group of monkeys in the trees about halfway down. We got to Mweka Gate around noon and went through the sign-out process which seemed to take forever. We wrapped up our climb with a tip ceremony. Phil and Eric gathered all of our porters around and called each one up by name. Phil gave each a great hand shake and presented them with their tip. These guys worked so hard for us over the seven days on the mountain earning only about $6 a day, so the good tips that IMG give them is really important to their livelihood. It was really interesting watching the reactions of the other porters who helped other groups. 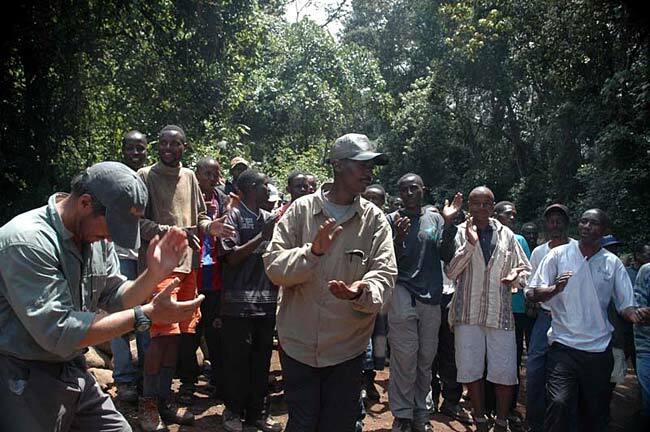 After each porter received their tip, Thomas led them all singing Kilimanjaro. I have to admit, it was pretty moving. What a great group of individuals. Then it was back to the Keys Hotel and hot showers! It took quite a bit to scrub off 7 days of dirt. We celebrated with Eric, Thomas and Reggie at a dinner that night and Phil handed out our IMG hats and Eric handed out the summit certificates. It was great to relax and enjoy each others company. Our group had formed a pretty close bond during the climb and I think we all truly enjoyed each others company. 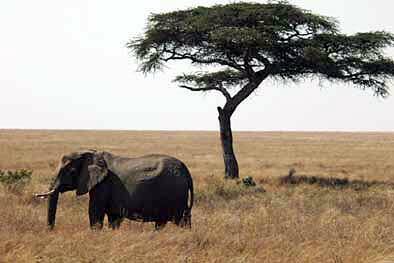 The primary purpose of our trip was behind us, and we still had four more days to enjoy each others company and see more of Tanzania. It was now time to see the animals! On Wednesday morning, we loaded everything up in the Wildersun bus and said goodbye to the staff at the Keys Hotel and headed into Arusha to catch a plane to the Serengeti. We had a couple of hours to shop for Chachka in one of the markets before lunch. Then we went out to the smaller airport in Arusha to board a couple of small planes. Unfortunately for Kerry, she let Phil know that she had a terrible fear of flying in small planes, so she was getting a ration of teasing. But she managed to get through it. Of course she didn't see any of the great scenery, AND she had a death grip on my hand, but she was all smiles when we got off the plane. 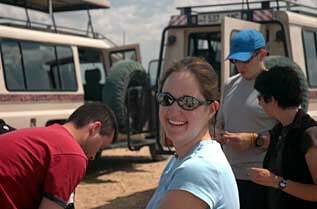 We all loaded into 3 modified Toyota Land Cruisers and headed off to see the wildlife. And it didn't take long. Our drivers and guides were Yuda, Emanual and Mallida. 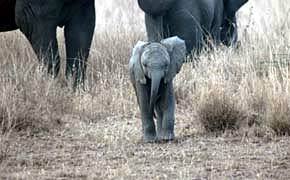 We all stood up in the back and almost immediately we were seeing elephants, gazelles, giraffes, zebra, baboons and ostrich. 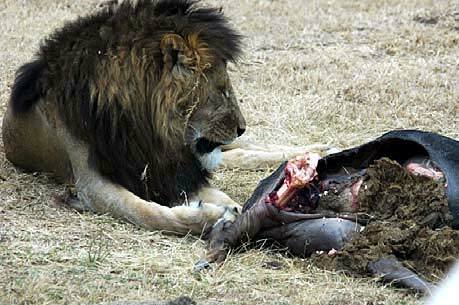 We saw a lion and lioness resting under a tree and learned some amazing facts about their mating process. 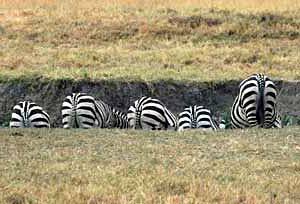 I even think that a couple of our group caught it on video, just no privacy in the Serengeti. 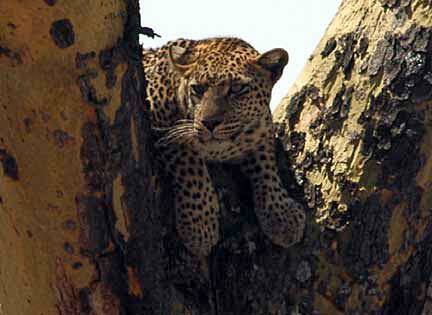 Our guide also found a leopard hanging out in a tree at some distance. 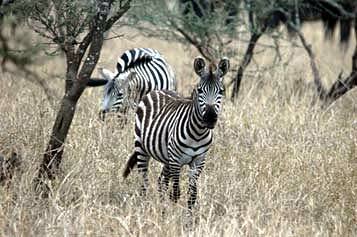 We drove around for about 3 hours and saw all kinds of animal. We ended up at the Serena Lodge near the Seronera River for the night. It was a really nice place. We had some great wine  Robinson Shiraz, and had a great dinner. 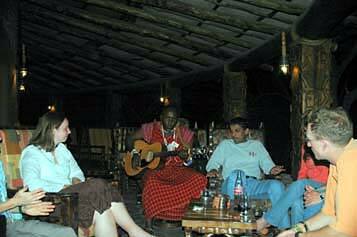 We ended the evening out on the deck with a masai "performer" entertaining. Both Laura and Kim tested their memory of tunes on the guitar as well. We were up the next morning and ready to depart by 8:30. 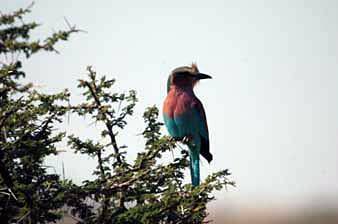 Today we would see more of the Serengeti Plain, stop at the Olduvai Gorge and then end up at Ngorongoro in time for sunset. We saw lots of animals  more of the same and a few new ones. Another leopard in a tree, cape buffalo and hippos, of course lots of different kinds of birds I can't remember the names of. 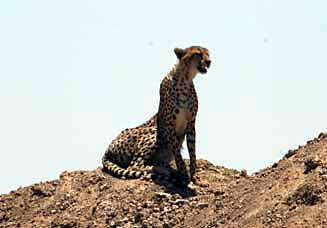 We saw a couple of cheetah (brothers) and a lone female cheetah. 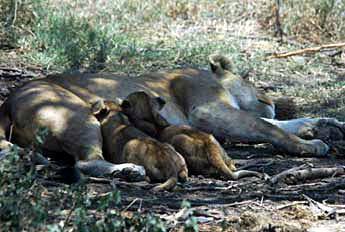 We also saw a lioness with her cubs. 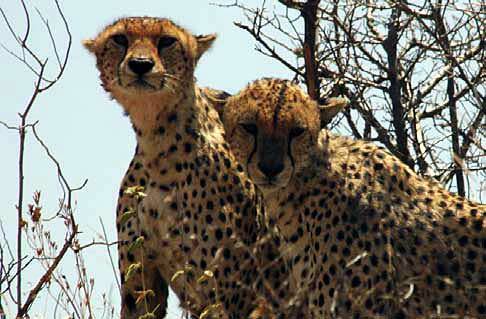 It was mind-boggling to be this close to all these wild animals, and they hardly seemed to notice us. We stayed at Norongoro Wildlife Lodge which felt more like an old mountain ski lodge than a safari lodge, but the shower felt great. 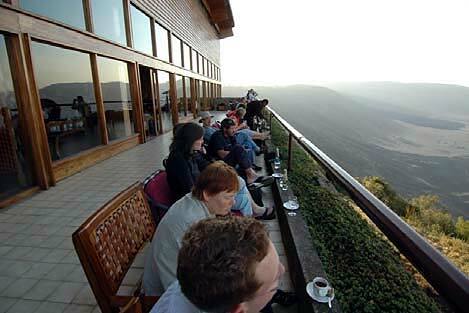 We were all showered and on the outside deck enjoying a drink in time to watch the sun fade over the Ngorongoro. It's an incredible view and one of the seven natural wonders of the world. Of course that started another quest: try to remember the seven natural wonders and then what the man made wonders were. 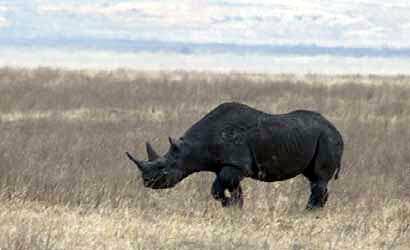 The next morning we headed down into the crater where we checked off the last of the big five: the rhino. 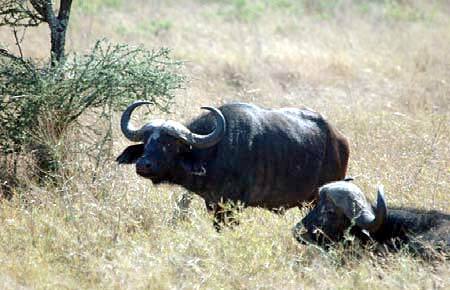 There were hundreds and hundreds of wildebeests and zebra. We saw the pink flamingos and lots of other birds. 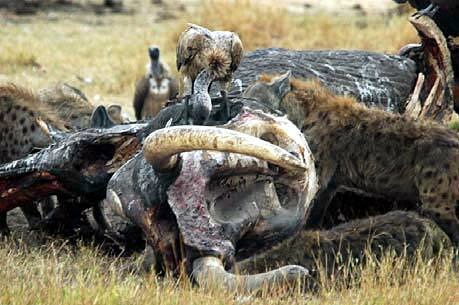 There was a group of hyenas and vultures feeding on a dead elephant, and a lion and a couple of females feeding on a dead wildebeest. 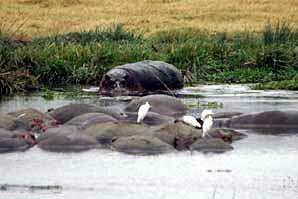 We had lunch near this lake with hippos and birds as our backdrop. What a great morning. Then it was back into the land cruisers to head up and out of the crater to the main road. 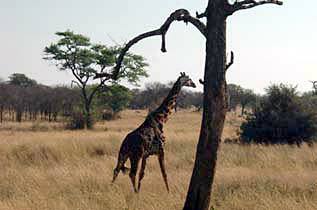 It was such a relief to get to a paved section of road to get to the Tarangire Park and our last stop. 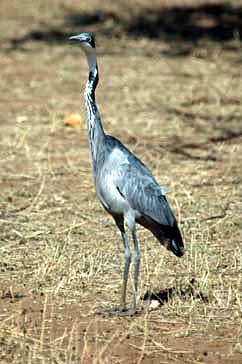 Of course we saw more animals as we drove to the Tarangire Sopa Lodge. This lodge was by far the nicest that we had stayed at, definitely very up-scale. Dinner was excellent and it culminated with a group of singers performing some traditional songs. Phil had also arranged to present Alpy and Bavesh with a special celebration cake of Kilimanjaro in celebration of their first month anniversary of their marriage. It was a pretty special moment. The next morning we loaded up to start back to Arusha, but of course we weren't done with the amazing trip. 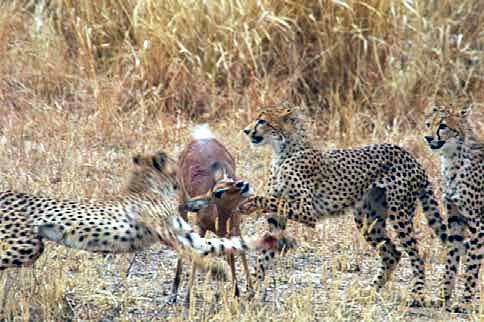 As we were driving through the Tarangire Park towards the exit we were lucky enough to witness a mother cheetah teaching her three teenagers to hunt. 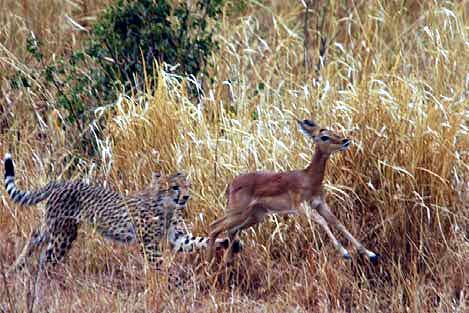 We saw her run down a gazelle and catch it (she almost didn't get it.) Then when we thought it was probably dead, and they were dragging it off, it jumped up and started to run away. 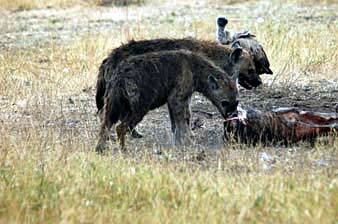 We watched as the three youngsters chased it down and after several attempts finally killed it. I certainly never thought we would see anything like that. And our driver and guide Yuda found almost all of the "little 5" for us. Even the turtle in the road. 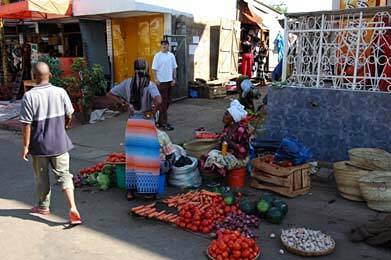 We got back to Arusha around noon for lunch and a bit more shopping. Then, sadly, it was time to head towards the airport. We had dinner at the Kia Lodge near the airport. It was time to part company with Bavesh, Alpie and Laura. They were heading for other areas of Africa . Kim and John were going to try to get a seat on our flight to get home earlier than planned and made it as far as Amsterdam. The flight to Amsterdam was pretty easy, especially since I pretty much slept the whole way. Once in Amsterdam, we started to go our separate ways, catching different flights back home. Phil and I were on the same flight back to Seattle and home. It was great to be back home and see Kevin, even if I was back on a plane after a day. All in all, this was, by far, one of the best trips I've ever taken. I believe that this was in part because it's always been one of my life's goals, but primarily due to the team that we became on this trip. 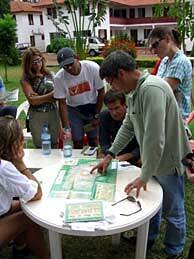 I learned so much from Phil as a guide, as a leader and as a person. And each member of our team contributed to our success. I would go on another trip with any one or all of the members of our team and hope that I get the opportunity to climb with them again. This was truly one of the most rewarding experiences of my life. Hope you all have many adventures to come! Happy Climbing!